In the designer I have added two horizontal arrangements. These are containers for the LED labels and LED buttons. The App Inventor 2 aia file can be downloaded at the bottom of the page. To handle the 2 new buttons there are 2 extra button click event functions. One function for button #2 and one for button #3. The new button click functions are copies of the button #1 click function except the references to the button have been changed so that the correct button is updated and the correct command is sent to the Arduino. 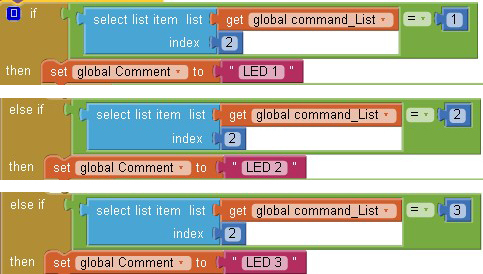 Because we have more than 1 LED we need to check to see which LED the command is for. This is done through the main if/then control. This tests for LED1, LED2 and LED3 in turn. On the Arduino side I added 2 more LEDs and 2 more switches. Corrected diagram. Thanks to Trieu for pointing out the mistake (I had TX and RX swapped on the Arduino). And of course the sketch needs to be updated to accommodate the extra components. When dealing with 2 or 3 of the same component keeping the sketch simple is probably the best way to go, therefore, I simply duplicate the code used for the 1 LED and changed the references. 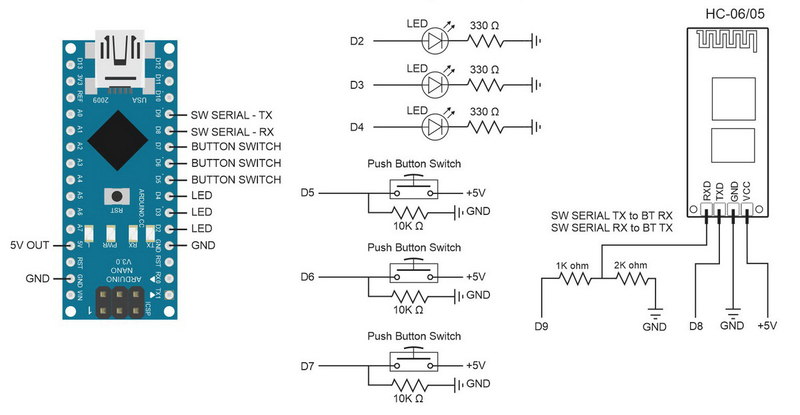 For 2 or 3 LEDs or switches I don’t see the need to complicate the code. The extra for loops required don’t really save space and make the code harder to debug. Duplicating code blocks may seem wasteful but it keeps the code as simple as possible which makes it easier to understand. There are now extra commands and these are handled by adding extra conditions to the processCommand() function. Again, I have kept it simple and just duplicated the existing code and changed the values to accommodate LED2 and LED3. L10 becomes L20 and L30, etc. if (receivedChars == 'L')                  //  Do we have an LED command? if  (receivedChars == '1')            // Is the command for LED number 1? if  (receivedChars == '0')       // Is the LED off? else if (receivedChars == '1')   // Or is the LED on? // We already know we have an LED command so no need to recheck. if  (receivedChars == '2')            // Is the command for LED number 2? // code for LED #3 not shown. you can see straight away what is happening. The code is looking for “L10″; is it LED #1 and is it off? Likewise for the checkSwitch() function. I duplicated the code for the extra switches. This means there are 3 code blocks that are almost identical but it keeps it easy to read. Although I have just advocated keeping the code as simple as possible you can see that the above has 3 code blocks that are almost exactly the same. This could be made better by using single code block with a variable for the switch pin and by using arrays for the switch variables and passing the pin for the switch to check to the function. Let’s see what it would look like. In the main loop we now use a loop when checking the switches and we pass the switch number to the checkSwitch() function. Rather than checking all 3 switches in one go we now check one at a time by telling the function which one to check. You could move the for loop to inside the checkSwitch() function and call it just once if you liked but this would make the function less flexible. You couldn’t, for example, check a single switch. In the checkSwitch() function we now create the commands on the fly rather than having 3 sets of commands hard coded in to the sketch. The command is created by using a dummy command and then replacing the LED number and the LED status. We now have the following and although it is much shorter it is also harder to understand. TMPcmd = pos+1+48;             // pos+1 is the LED number; 1,2, or 3. And in the processCommand() function we have done away with the long list of if/thens and reduced it to just a few lines. // 0 and 1 is the same as LOW and HIGH. and in a months time I will have no idea what it does. Download the App Inventor 2 aia file and the 2 Arduino sketches. 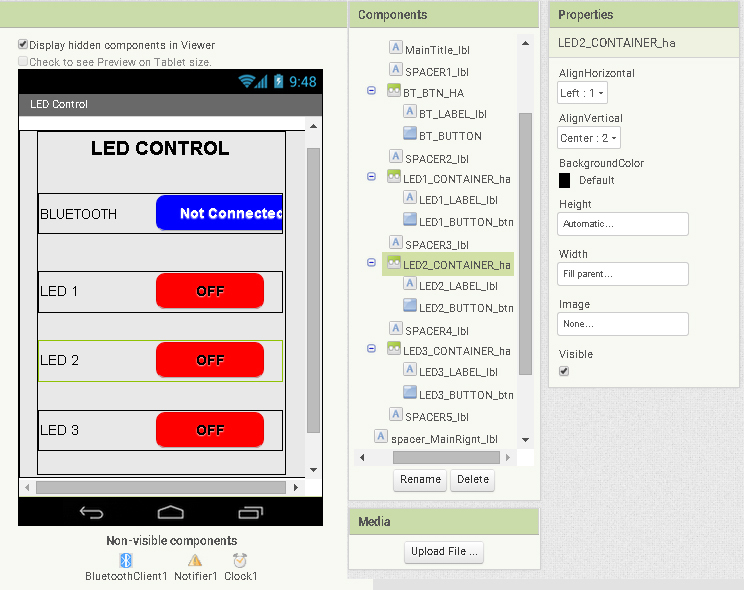 This entry was posted in Android, app inventor, Arduino, Bluetooth by Martyn. Bookmark the permalink. WHY AM I ALWAYS FAIL? IS THERE SOMETHING WRONG? Please describe what problems you have or what is not happening? Is the BT module configured and connected correctly, have you have basic communication working between an Android app and the Arduino? Can you compile and load the Android app correctly? Connected ok but when control, nothing happened, asking about rx and tx, can i connected rx and tx from hc05 to aduino nano? and can i replace led by relay module? Did you do the earlier examples and have you had basic communication working? ohhh it ok when i changed between Tx and Rx from hc05, not as ur schema. And can u show me how to get status from arduino: example when we have 1 led on and when i connected it not show on my phone until i press it? I can’t upload the code to my arduino. Why is that? 2. turn on 2 led after that i connected by android, but in android not update 2 led on already. Can u help me solve 2 problem, many thanks to you..
it sounds like the phone is are not receiving the commands from the Arduino. Check the wiring between the Arduino and the BT modules. If you still have problems try one of the earlier examples and get basic 2 way communication working. are you using the complete sketch? Hi. I use Arduino Leonardo and I have a problem with serial communication. I also tried the code from the second part, the same problem. Do you have any solution for Leonardo board. Hi. I use Arduino Leonardo and I have a problem with serial communication. I also tried the code from the second part, the same problem. Do you have any solution for Leonardo board? I solved the problem. For the Leonardo in AltSoftSerial Library TX, RX is on pins (5, 13). Verry good job! Thanks a lot. 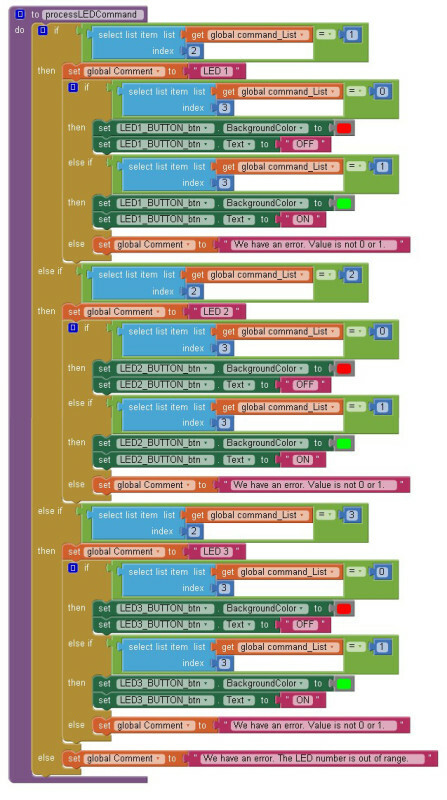 Sir, could you please show me how to change the code to be able to use 8 LEDs without switches, but to the state LEDs was still recognized after disconnecting and reconnecting?For example: if 4 LEDs of 8 are turned on, then after leaving the android application and re-start it 4 status LEDs will be remembered as enabled. Thank you and best regards. if ((state1 == state3) && (state1==state4)))?? Note – in the below I use pins 8 and 9. These are connected to the Bluetooth module. Change the pins to suit your requirements. and then increase the limit in the relevant loops. i’m still working to add fourth button on the app but now response when i have change the status of the button? and i have to replace the list index number of blocks that show me the length of (L) is large there is an error !! so help me to do this?? What à good job ! Can you telle me thé software you use to draw jour diagramme ? A very old version of CorelDraw. When trying to work with app (not work ) why? You could do this using only an Arduino but it would use all the pins including using the analogue pins as digital pins. I would suggest looking at an LED matrix and possibly a voltage ladder for the switches. These are beyond the scope of this post but google will give you many links. The LED matrix does not have to look like a matrix. You could have all the LEDs in a line. For the software, the above example should be scalable. Just extend the arrays. I’m sorry I can’t. But learning to do this yourself will give you a better understanding of programming the Arduino. You can also ask on the Arduino forum but I doubt anybody will help with the actual code. how can learning to do that? And learn the basics for checking the state of a switch and how to turn LEDs on and off. Do the same for App Inventor 2. Also look at the code in the part 2 guide. Try to figure out how it works. Then compare it to the code above. sir is this project work with aruino mega ?? Or better to use one of the additional hardware serials. Thank you for this very beautiful and very useful project. I’m not familiar with the inventor’s waste of course but the project worked ok. I tried to adapt it to an esp 8266 module because I also have TX / RX and I can go directly from the WI / FI network but my bad knowledge about the inventor has made a mistake. In fact, my phone is connected all the time to Rooter and esp-8266 is also connected to the router, so the connection function would be useless at WI / FI. I can not find commands that can talk with rooters, that is to send the command to the rooter and esp to receive it again by TX / RX to talk with arduino. 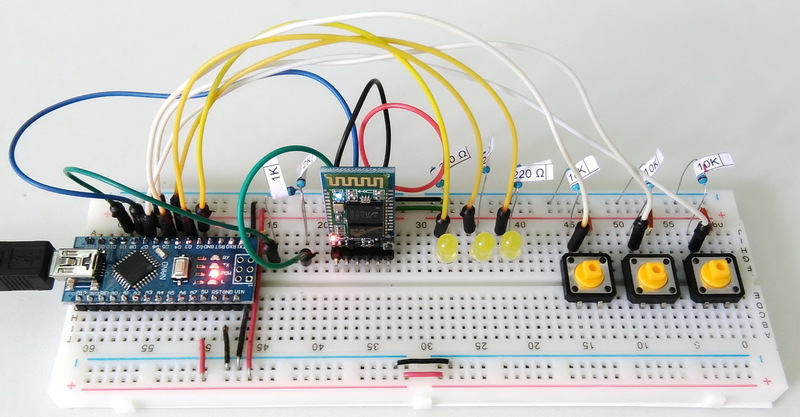 Which can do by sending commands from the brauser or the phone in the form of: 196.128.0.6/on1 or rest of the commands that esp receives them and transmits them to arduino or esp 8266-12 would have enough pins to execute the commands without Arduino. Most of the help I get to receive the reverse confirmation on the phone, that is, the button status so with arduino i would like to make the + esp8288 device. AI2’s web component works in a very different way. There are 2 main ways of connecting. 1 – via a web page. I have a guide that covers creating a web page to control an LED at http://www.martyncurrey.com/esp8266-and-the-arduino-ide/. Note that this uses the Arduino IDE to program the ESP8266. To find out more about using a web connection from inside an app start with the guides on the AI2 website or search for something like “app inventor web” and “app inventor esp8266″. i finally found something that can help. i have bluetooth rgb led rock light on my truck and i currently turn them on/off cange colors with an app on my phone. i want to get rid of the app on my phone and control the lights with buttons mounted to in my truck. i was thinking with bluetooth arduino with buttons attached to it sync it up with the lights and just push buttons to control the lights. very new to arduino and coding and stuff im hoping you can help me. Can you send my design block for global command list? I cannot able to make a list with 3 index. what your sketch does when it gets a LED 1 command. Dear Mr. Martyncurrey, I am 72 years retired Telecom Engineer and my hobby is home automation. Thank you for publishing wide range of interesting projects and my hearty thanks for your help to the community. I need your help to change the momentary switch to on/off switch for sensing the garage door status and update it is Closed or Opened. How do I change the Toggle function to ON/OFF function to use reed switch. this is beyond the scope of the site but you can think of the reed switch as a regular switch. It is either open or closed. Experiment, replace a button switch with the reed switch and see what happens when you move it. Can i ask if this programme can work also for only one led and 1 button ? I installed without modifying the Arduino program in my NANO and the latest program for APP INVENTOR. On the other hand I see the information on the series management of the arduino. With the other programs (No. 2) for example, it’s the same problem. I checked my connections buttons, it seems to me well. Do you have an opinion please? To know that I use arduino NANO and a HC-06 module that works. 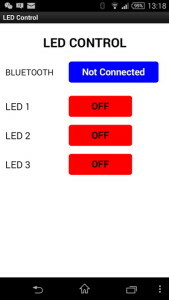 When I connect in Bluetooth with the mobile phone, I would like the buttons of the leds on the mount to be in real state (lit or not) at the time of the Bluetooth connection. It is probably necessary to put in the “void loop ()” digitalRead (LED1_PIN), and LED2_PIN, and LED3_PIN on arduino, but I go around in circles, I can not know what to put in the program App Inventor, I use your arduino sketch: “TWO_WAY_LED_CONTROL_3_LEDS.ino” and your App Inventor program: “TWO_WAY_LED_CONTROL_3_LEDS”. Thank you for being able to help me please? You have probably realized you need to do this after a connection is made. The way I handle this in actual projects is to have a handshake/connection command. I then use the receipt of the connection command to trigger an initializing procedure. All the bluetooth set up stuff is in it’s own function and only called when the “HELLO” message is received.